What is an Appalachian Woman? When I consider this question, it is this picture that fills my mind. This is my great-great grandmother Arizona, a Cherokee-Appalachian woman. Every time I look at this picture, I think of strength embodied. 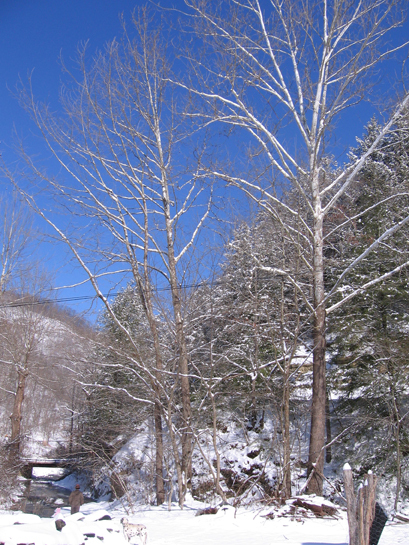 When I think of strength I think of Appalachian people. Though I never met her in person, I feel like I know her. When I look in the mirror, I see her hairline… the shape of her face, her forehead and broad shoulders. 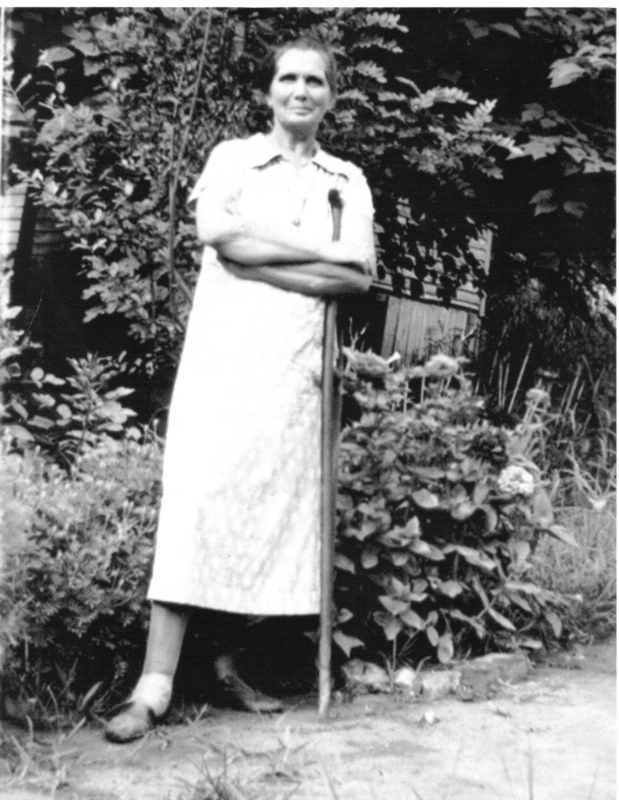 Appalachian women of her time had strength like I wouldn’t even pretend to know. It was a strength that was bigger than they were, because their faith didn’t stand in their self or their circumstances. It was a faith in what was truth was truth, and what was not would eventually pass away and could be endured as something finite. Mountain women have lived through hard hands on work, isolation, raising children and food. After a time, they lived through being crowded together in coal camps, black dust flying, covering everything, finding happiness in just seeing the whites of her husband’s eyes on more time. They nursed babies and broken hearts. They fought hard fights physically and mentally. Mountain women bore the iniquities of a whole people on their backs whether the burdens they bore were any fault of theirs or not. They lived by stern principles. They lived by know-how. I was in a conversation recently with someone who said, “We aren’t really mountain women anymore I don’t guess.” I replied with thought at first. I hadn’t really considered that before. Then, I thought… we haven’t been allowed to be for a long time in some ways. We’ve been told to do things another way. Our way has never been good enough because it isn’t like the way of those outside of these hills. But, look at these hills. They take a different way of life. The city takes a different way of life than the country. Living by the ocean takes different know-how than living on the plains. I can’t pretend to know what is best for those who live in a completely different environment than myself. It brings things back to the issue of culture. Are we mountain women anymore? Are we really? Or is a commercial culture perpetuated by consumerism and media taking over all the intricate cultures spread throughout our country? I believe there is, but yesterday I was at Burger King to let the girls play in the PlayPlace, and I watched all the mothers. I listened to the phrasing of their words. I saw how they handled their children, set their food before them, helped them put on their coats. I saw mountain women. There is an element there that can not be mistaken. It is born in us. As I am sure women from other states, ethnicities, spritualities, can identify in their common people quirks and authenticities that aren’t apparent to others, I saw them in these women. 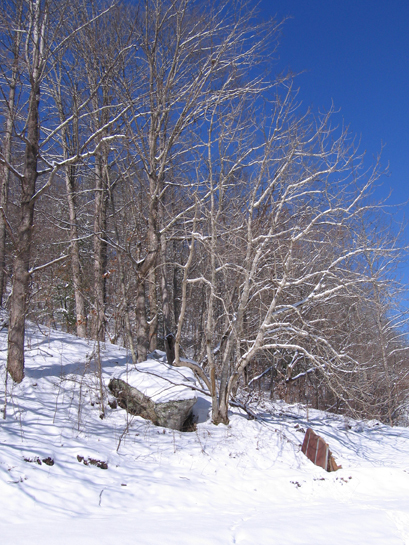 We have lost so much over the years as Appalachians. It is obvious there is something missing here that had not always been missing. I think it is the confidence in that we are wonderfully made, and what has been given us through our collective upbringing and experience is good enough. I like to think it is only misplaced and will turn up again. Us Appalachian women will be the first to see it when it does. After every exhilarating experience, is the period of being brought back down. This week has been that for me. I am working diligently to get my first class series on the way, but I am feeling the fatigue of all the mental and physical work that has gone on since the training. I like hard work though, and I am so grateful. A local chiropractor is hosting my first series, and I am so excited! It is a blessing to me, and everything is coming together. I can’t wait to be a “teacher” again! Otherwise, we have our 5th big snow of the last two months. I have to be honest here and say I am tired of that – beyond tired. I had to get out in it yesterday and take myself to the doctor, which required a little hike to the vehicle. Then, I had to drive 20 miles an hour, which is extremely hard for my wound up self to do. John told me about 50 times to be careful and not rush. I said that I wasn’t setting out to get myself hurt, but to go to the doctor. We laughed. So, it was no surprise to me that by the time I reached the doctor in the next county, that my blood pressure was a bit elevated, and I had the beginnings of a headache. I have been having these headaches that radiate up the back of my head, and my neck constantly feels stiff. 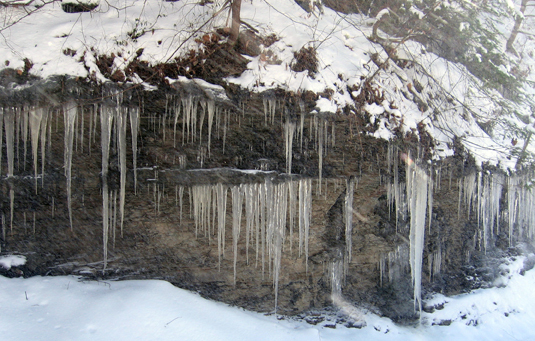 The cold that I have been battling for nine days now hasn’t helped. The doctor said they are tension headaches. I’m not sure from where the tension is coming. I wonder how much of that kind of thing is genetic. If anyone has any ideas, please send them my way. Yeah, I know, you’re thinking – a yogini having a problem with tension, that stuff must not really work. I say, yeah, you’d think, but I’m still “practicing” and it is what relieves me most days. It’s like magic. 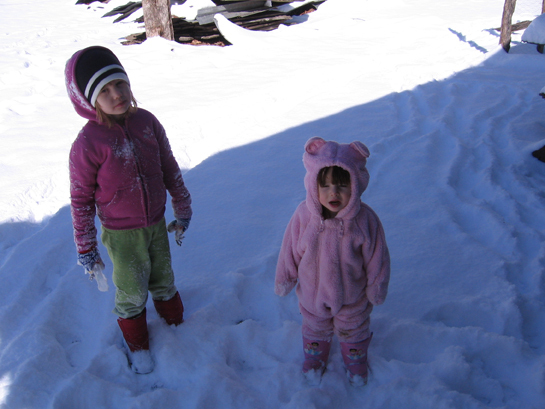 The girls have decided that they don’t like snow. Deladis is not happy at the large flakes falling today. She said it’s too cold and she is ready for Spring. Aren’t we all? I’m pulling all the stops to keep them going through the days without too many meltdowns, but the last few have been harrowing. Both of the girls have began their first period of tears shortly after waking the last two mornings. Typically, I don’t have to think about that until the late afternoon. 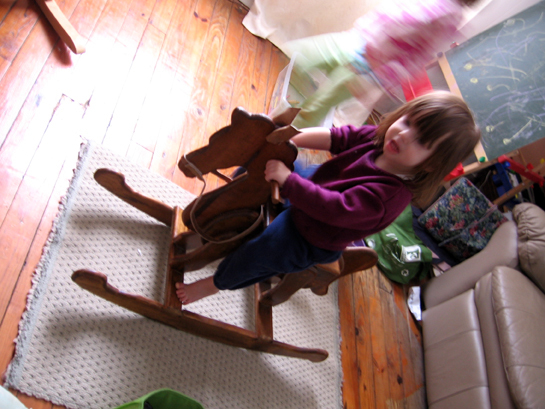 Today, I pulled the rocking horse out of their bedroom, hoping to help them release some energy. It helped for about 10 minutes. Honestly, I don’t think any of us has too much energy left aside from the anxious kind. This post seems like one big long whine. I’m sorry. I’m just tired. I am also very grateful. I am grateful for the ebb and flow of life, because there is no way we could last through any one period forever without becoming numb. I am grateful for my two little girls and their leaps and bounds everyday. I am grateful for a loving husband and best friend who takes taking care of us very seriously. I am grateful that Spring is on the way and soon I won’t be blowing my nose a hundred times a day. We will be planting a garden, playing on the back patio, and existing in Mother Nature beyond the 900 square feet of cabin. My brown eyed girl, I believe, has just ended my four and a half years of breastfeeding my babies. It has been 2 whole days. She fancies herself a big girl so soon. So soon. I’m Home and Well Trained!!! Just wanted to take a minute and tell everyone I am home with a certificate for my training and so many new ideas that I can’t wait to share with my community. It was most definitely a time of renewal, growth, and learning for me and I am crazy excited about it. I must tell you too what Deladis said at the end of the second night when I got back to where we were staying. 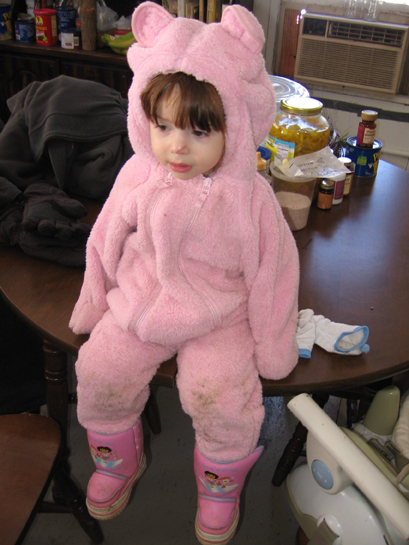 She said “Mommy, I’m ready to go home.” I said, “Really? We’ll be leaving tomorrow.” She responded, “Mommy, I love how you cook.” 🙂 I couldn’t help but smile. Those are cherished moments when you realize that despite how it feels sometimes, what you take the time to do for your children is important and they appreciate it. 🙂 How sweet! Later this afternoon, I will be making the long journey into the city. Friday is the first day of the workshop that will begin my formal training to become a certified childbirth educator. As I have mentioned before, the training is through Lamaze and I will eventually receive certification from Lamaze International when I complete the requirements. I am so excited I can hardly contain myself. Knowing my perception of myself ten years ago, I would have been very amused if someone had suggested to me that my life would take this path. I was in my early twenties and while I had just recently witnessed the natural birth of my first nephew and acted as a birth coach for my sister, I had no plans to give birth myself. I thought giving birth to be a miracle and it absolutely made me embrace my womanhood in a way I never had prior to witnessing the glorious capacity of a woman’s body. I was sure though, that while other women were enjoying pregnancy, birth, and motherhood, that there were other plans for my life. Not that I thought those plans more dignified at all, but more that I felt like life had not prepared me to fulfill that role in another’s life. 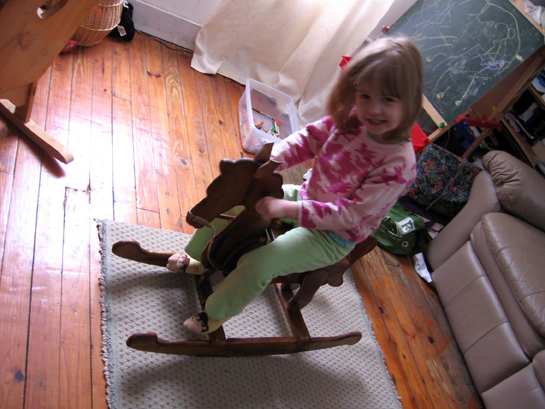 I felt like I was doing the child who I would birth a favor by choosing to remain childless. I look back on my life at this juncture, and it is obvious to me my preparation through everything from my birth order, life experiences, and educational choices for motherhood and teaching (or should I say sharing my experiences with others and guiding the search for information). I was the first born of my mother’s children and I tortured my baby sister day after day with school play. It was either that or her torture me with trying to copy and become a part of my independent play. 😉 I majored in English with a minor in Creative Writing in college, only to accept a job as a Language Arts teacher in the public school system. I went on to receive a Master’s in Teaching. It was like I had forgotten how I told my family that I wouldn’t be a teacher when they had suggested it to me so many times. I was going to be a writer. Then, I experienced birth through my sister, and almost five years later John and I desired to make a family. It was sudden, and in spite of all the plans to the contrary. There was the planning for my birth – the dreaming. Then, there was the experience. I didn’t embrace what happened to me and my baby girl in any way for the longest time. It wasn’t suppose to have happened that way. Not to me. I didn’t understand that it was another leg of my journey. Ivy’s birth gave me a little more understanding, and yet I still didn’t accept what my heart was asking me to do. I felt like everything I had experienced and studied about would eventually bring a correction of what happened to me. It wasn’t about that at all. Healing isn’t always a reversal of a problem, and I would argue that most often it is not, but it is a renewal of our perception of that problem. That self that I thought I was, wasn’t me at all. It was an ego denying my whole self peace. I am complete just as I am. So, now I have this awesome opportunity to put myself to use to a cause greater than I could have ever imagined for myself. A cause that is much greater than I am. It is not something I could ever take on of my own accord or understanding, but it is a movement of a collective body of women and men, working, in the best of times, as one force. To help other women learn about their bodies, enjoy their pregnancies, plan their informed births, and process the experience is a huge undertaking, but it is one that I love. It was done for me, and I am so thankful to those women. Not only will I have the opportunity to be an active part of a birth community, but I will be helping women in my mountains. The birth tradition in these hills is so rich and beautiful as much as it is hard to grasp at times. I think of the courage of those women and the trust that they put into the natural course of life. I want to help women from whatever place they come from in their journey to motherhood and through whatever their plans may be, help them to understand what is happening, to trust their body, and help them to feel comfortable and safe in the choices they make for themselves and their babies. I’m thankful that I am finally able to listen to my heart. It is much easier than trying to rationalize contrary choices. I’m thankful for this opportunity. I’m able to embrace what happened to me as an experience in a longer journey that has a larger purpose than a few events in my life. Not that those experiences were easy ones, but more that they helped me to grow as a person. No, it wasn’t a part of my planning, but it chose me, and I’m so glad. 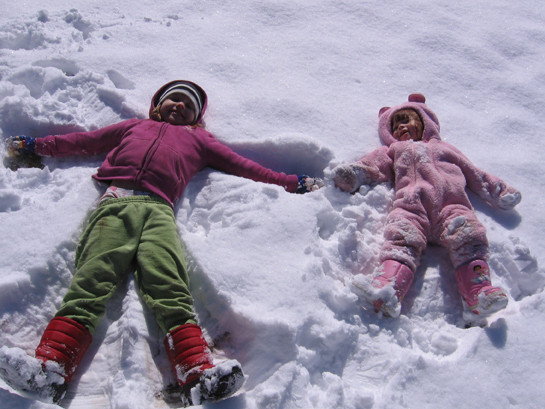 There’s nothing like six or more inches of snow to give you a hankering for a treat from your childhood. 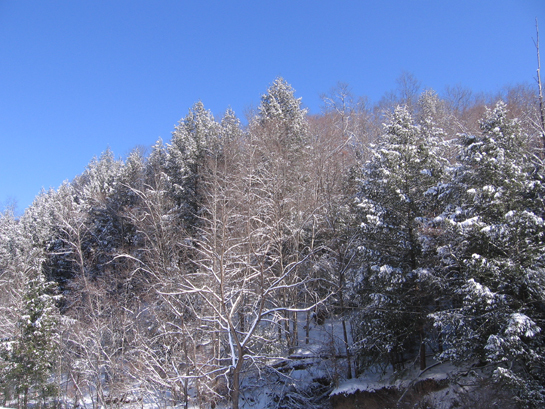 Here in the mountains a big snow provides an easy way to make an iced cream treat that is as good as it is cold. 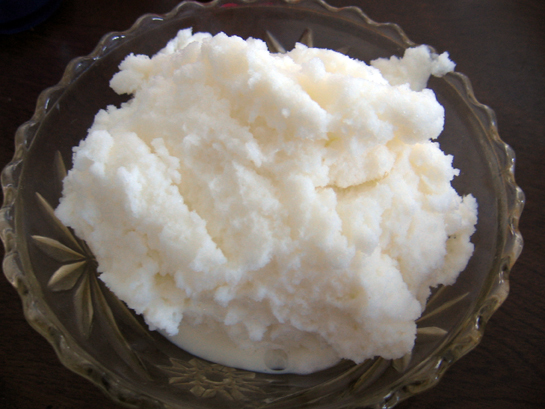 Snow cream is simply made given you trust the snow to be clean enough to consume. The way I make it, all of the ingredients are estimated. The important know how is the concept I suppose, then you can make it to your liking. Start with melting a sweetener of your choice into some heavy cream or whole milk. (You can also use low fat milk, but I don’t think it would taste near as good or be very nutritious for you. Treats should not be empty calories in my opinion, so go for the gusto!) The sweetener we use is honey and/or maple syrup. (We use only unrefined/moderately refined sweeteners that hold plenty of nutrients such as iron or enzymes.) Since our sweetener is already liquid it doesn’t require a lot of heat to completely mix with the milk. Allow the milk mix to cool, and add a little vanilla… or a lot if you are like me and love strong flavors. Next, gather your snow in a large stainless steel bowl or pot. You will want to compact it a bit and gather a large amount. 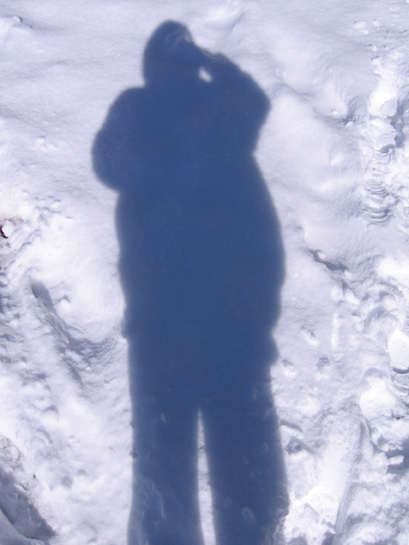 Scoop from the top layer of snow only, being careful to not dig down too close to the ground. At least 4 inches should be on the ground for making snow cream. I was always told not to eat the first snow of the year as well. Once back inside, slowly mix the milk soup into the snow stirring thoroughly, but with a gentle touch. Keep mixing until it is to your desired consistency, then eat and enjoy! The Haywoods certainly enjoyed their snow cream this year.